Most of the human rights issues covered by international media and NGOs concern the Palestinian population living in the West Bank and Gaza. Notwithstanding the fact that the Bedouin communities living inside Israel are being increasingly deprived of their resources, the discrimination they are facing usually receives less attention by the international community. A visitor seeking to embark on an alternative tour through Israel has to include a Negev tour that takes into account the situation of the Bedouins living there. With their Bedouin Reality Tour, Green Olive Tour provides you with the rare opportunity to listen directly to those, whose voices are rarely heard and whose futures are typically being decided over their heads, as shall be seen in the following. Approximately 160,000 Arab-Bedouins call the 13,000km² of desert that stretches out in the south of Israel and that is usually referred to as Negev, or “Naqab” in Arabic, their home. Having resided in those lands for centuries, today's Bedouins constitute the most disadvantaged citizens in Israel and struggle hard for equality, recognition, and pursuing their way of life. Half of the community lives in government planned towns, with the remainder residing in 45 unrecognised villages, which lack any basic services, such as running water electricity, garbage collection, proper education and other social services. In addition to that they live under the constant threat of dispossession and displacement. 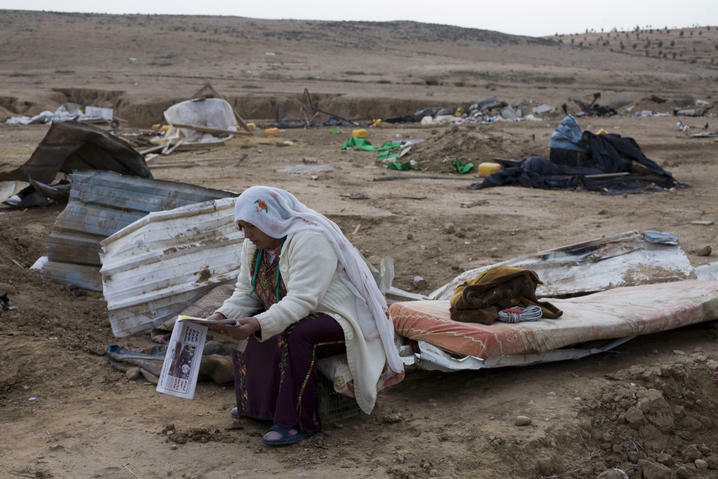 Most prominently, the unrecognised village of Al Araqib has been demolished 35 times in order to give way to a forest that the Jewish National Fund is planning to plant on Al Araqib's land. More recently, in September 2011, the Israeli government approved a plan for the regulation of settlement of Arab Bedouin citizens of Israel in the unrecognised villages in the southern Negev. Instead of recognising the villages in question, and connecting them to infrastructure and services, as suggested by the Regional Council of Unrecognized Bedouin Villages and Bimkom - Planners for Planning Rights, the Prawer Plan, named after Ehud Prawer, the head of the Committee who prepared the plan, outlines arrangements for permanent Arab Bedouin settlement within a clearly demarcated area in the Negev in the form of a completely unnecessary expulsion of 30,000 people and their relocation to Bedouin towns. Obviously, no single Bedouin representative has been consulted or was involved during the planning process or before the approval through the government and since the state only recognises those ownership claims to the land that were filed prior to 1979, there will be hardly any monetary compensation or compensation in the form of land. At the time of writing, the Israeli government has just postponed the deadline for public objections to the bill and there is still time to respond to this shameful act of discrimination and land theft. Please, click here and send your objection to the Prawer Plan.